As an art teacher, I’d normally start out with some catchy information about Wassily Kandinsky, but I’ll save you all the gobbledygook. 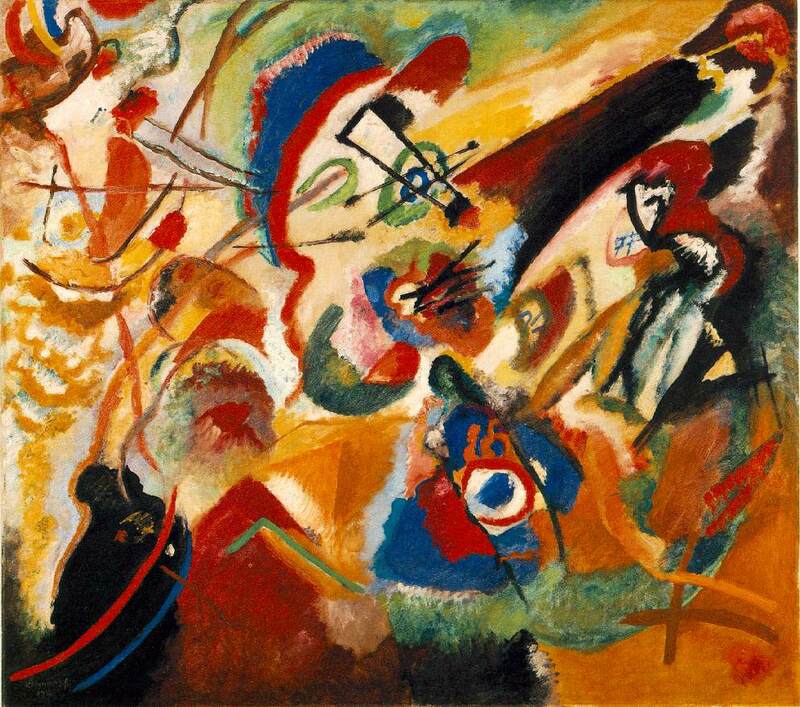 Kandinsky created colorful creations and was part of a collection of artist considered Fauvists. He also hung with some Impressionists and had his toes in with the Abstract-ers, too. He was also a long-time teacher with his buddy Paul Klee at the Bauhaus. What I love about Kandinsky’s work is that it is really colorful, which grabs the attention of kids and gets them excited about making art. Older kids can explore the concepts of abstract and color with this activity along with learning more about Kandinsky, while the young ones will enjoy tearing, glueing, and basically making a big mess. 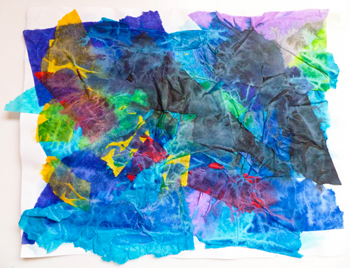 Collaging is the art of pasting a collection of things together to make a finished artwork – so why not use some colorful tissue paper with Kandinsky as inspiration! All you need are paintbrushes, glue, a variety of colors of tissue paper, and a paper. Start by taking a look at Kandinsky’s work. One of my favorites (and the inspiration for this project) is Fragment 2 for Composition 7. Even if you have a wee tot like I do, they get a kick out of looking at art. You can turn it into a learning opportunity by doing some simple color recognition (what color is that?) or checking out simple shapes. For the older crew, ask engaging questions about the artwork to get kids thinking. Discussing why Kandinsky sometimes used non-representational colors might be a good place to start. So, once you’ve had your fill of Kandinsky’s creations, get out your materials. It’s a good idea to cover your work area for this activity with a plastic garbage bag or some old newspapers – tissue paper is messy! Your child can help get things ready by grabbing some glue and a couple of paintbrushes, along with a variety of colors of tissue paper. Slosh together equal amounts of glue and water in a small dish. Don’t go crazy or anything – about a Tablespoon each of water and glue will be more than enough. Your child can help mix the water and glue together with a paintbrush. Invite your child to start tearing colors of tissue paper. Tearing encourages those itty-bitty muscles in your child’s hands honing her fine-motor skills. If you’ve got a young one (two to five years of age) they can go willy-nilly tearing and then coating with a layer of glue water, but for an older child (six and up) you can encourage her to think about design and balance in her artwork before gluing her tissue pieces down, motivating her analytical left brain to work alongside her creative right brain. Encourage your child to cover her Kandinsky collage with glue to keep all those colorful tissue pieces in place. Once she’s finished, she can take a final look and decide if any additional color splashes are needed. Once the collage is dry, you can proudly display the artwork next to a print out of your child’s Kandinsky inspiration for others to see! I absolutely LOVE Kardinsky’s work, agree so colourful!